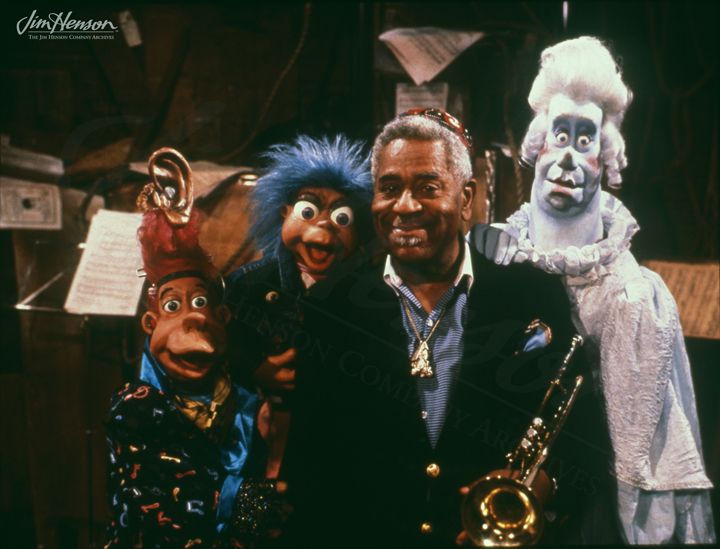 As an appreciator a jazz, Jim must have been thrilled to have trumpeter and composer Dizzy Gillespie as a guest star during Season 4 of The Muppet Show. Taped in two parts in July and October of 1979, Gillespie’s episode provided an opportunity for him to demonstrate his virtuosity as a musician and also his comic timing. He sat in with The Electric Mayhem on the “Saint Louis Blues” and jammed with Floyd and Zoot on “Little Bit of Dis”. Perhaps in a nod to his well-known composition “A Night in Tunisia”, his final number “Swing Low Sweet Cadillac” was performed with Arabs, camels, and harem girls in a Middle Eastern palace. Apparently, Mayhem member Floyd made a real impression. When asked about his favorite Muppet on the show, Gillespie said, “Man, that bass player Floyd – he’s a real mover.” At the end of the show, Gillespie did compliment his host Kermit by mentioning his appreciation for the way frogs could puff out their cheeks. Clearly, it was a positive experience for all involved. When Jim produced his music education series The Ghost of Faffner Hall in 1988, he made sure to include Gillespie as a guest. A confused Fughetta thought Gillespie was there to teach her a lesson on her ear trumpet, and once that was cleared up, Gillespie got to play. This time around, along with “Con Alma” and “Hot House,” he played his “Night in Tunisia.” The camels stayed home. See Dizzy Gillespie on The Ghost of Faffner Hall. 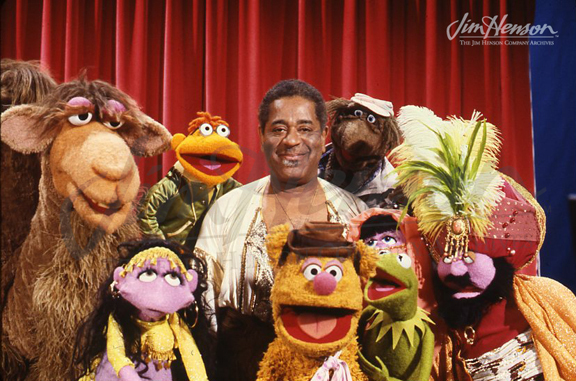 Dizzy Gillespie on The Muppet Show, 1979. 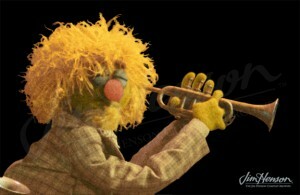 Lips, The Muppet Show trumpeter. 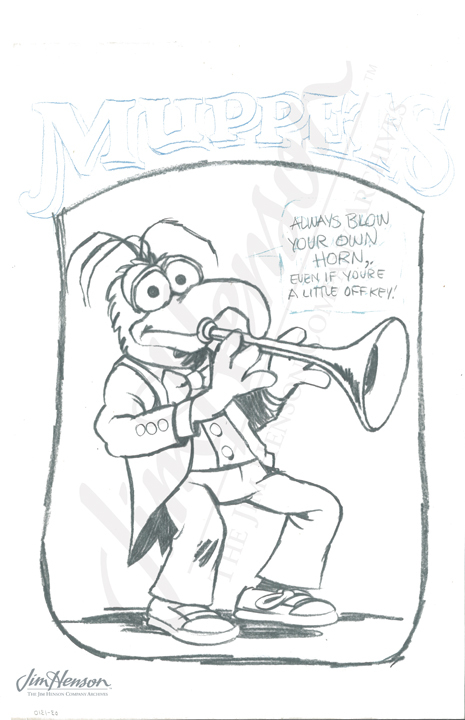 Gonzo gets into the act in this piece of licensing art. Dizzy Gillespie on The Ghost of Faffner Hall, 1988. 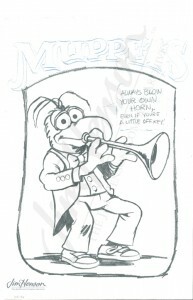 This entry was posted in 07-July '79, 1979, Muppet Show and tagged David Lazer, Dizzy Gillespie, The Ghost of Faffner Hall. Bookmark the permalink.